How do I activate my Barclay's Payment Gateway? Merchants setting up the Barclay's Payment Gateway will first need to make their account live on the Barclay system, before the payment gateway can be used. During this activation process, you will be asked for the following information. If the Barclays interface does not automatically provide one, then one will need to be created within the Barclays account. 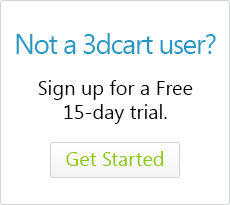 If you've already set up the Barclays payment gateway in your 3dcart store, the passphrase used for activation will be this one. This is not necessary for activation.